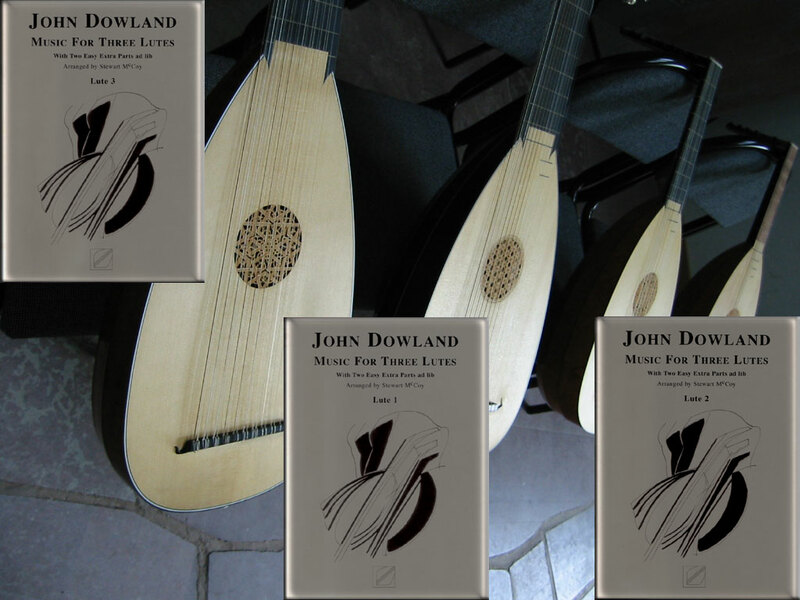 The music to the video "Seven Songs and a Galliard"
The first edition of Dowland for Lute Trio was well received and quickly sold out. Before printing another batch, we took the chance to put in page numbers, and make a few minor corrections to the music. Otherwise the second edition is much the same as the first. The files allow you to practice Stewart's Dowland trios without needing to find other competent players or the always elusive bass lute. with two easy extra parts (GG) to be added ad lib. Here are some of Dowland's best-known pieces – Lachrimae, The Frog Galliard, and others – together with some of his less well-known ones like The Shoemaker's Wife and Thomas Collier's Galliard. For players of more modest ability, there are also two extra parts which provide simple chords and an easy melody line, which may be added to the trio or played together as a duet. Ideal for lute playing days, early music courses, or any occasion when lutenists simply want to have fun playing together. Contact: ekebo07(at)glocalnet(dot)net and inform me about your order and the mailing address.